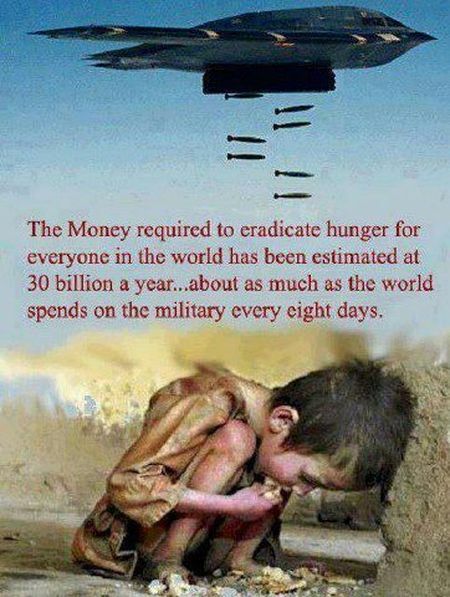 The picture above was posted on Facebook by a person who thinks war is bad. Apparently, she believes that some of us disagree, and that seeing it might change our minds. I find it dishonest and offensive, for several reasons. 1. It is dishonest because it suggests that the problem lies in the existence of armies, and not in human aggressiveness and acquisitiveness. Even if we could press a button and all military forces would disappear in a flash, the money spent on them magically appearing in national treasuries, is it likely that hunger would be eradicated? In the so-called “developing” world, where the great majority of the population lives on a subsistence level, aid money is routinely stolen to finance the lifestyle of a few kleptocrats. Why would this be expected to change? Eliminating armies would not end aggressive behavior. If Israel, for example, didn’t have the IDF to protect it, it would be gone in a matter of days, its borders overwhelmed. The Arabs wouldn’t need armies to accomplish this. Of course, there is no magic button, so the only way to implement an end to armies would be unilaterally. No sane person could suggest that this would work. How would Vladimir Putin, Mahmoud Ahmadinejad, or numerous others react to the announcement that the US had decided to end military spending? 2. It is offensive because it suggests that those of us who support the military or serve in it don’t care about human suffering, particularly the suffering of children. It suggests that we believe that war is a good thing. It implies that soldiers are either immoral or dupes. But I and many others distinguish between just and unjust wars, and believe that it is not a crime to engage in a just war. The fact that it may even be an obligation, in some cases, to fight does not imply that it is a welcome thing. 3. It is offensive because it implies that those opposed to the military are morally superior to those who support it, when it may be that they are simply confused about the difference between the real world and an imagined and unrealizable utopia. This entry was posted on Wednesday, October 3rd, 2012 at 10:50 am and is filed under General. You can follow any responses to this entry through the RSS 2.0 feed. Both comments and pings are currently closed. Weapons proliferation is a very lucrative busines and it’s understandable that the weapons industry rejects any effort to curtail sales. Of course the issue of national security is used to justify the industry’s predominance. It’s smart marketing. The proposition that our resources should be used for humanitarian projects like ending starvation is eminently moral and just. To claim that this is offensive is a moral inversion unworthy of any Jew. The fact that some people or corporations profit from the need to defend ourselves — and maybe even profit more than they should — doesn’t mean that self-defense isn’t necessary. As far as ending starvation is concerned, it’s been pointed out many times that there is plenty of food available in the world. The problem has been corrupt governments and other impediments to getting it into the mouths of people. Can unilateral disarmament work in today’s world? How do you plan to solve the problem of, for example, African kleptocracies stealing aid funds? What is your answer to the conflict between democracies based on enlightenment principles and radical Islamism? Do you really think that those who disagree with you are immoral or stupid, and would not prefer ending hunger to fighting wars? There are just wars, but they are rare. The US hasnt pursued one since 1815. Israel is a separate issue. The only war I really disagree with is the Suez War. It was probably justified, but not worth it. Egged on by France and Britain, Israel joined them in a stupid war. As for the second half of the Great European War, I have trouble considering it just. The Allies didnt even make any attempt to stop the Holocaust. That was an effect of defeating Germany, but not at all a goal really. Had I been president, I wouldve stepped aside upon hearing the news of my brothers being slaughtered. My Vice President would become acting president per the Constitution. I would then call on all Jews and other interested people to join me to stop the Holocaust. If Hitler wanted to rule Europe, thats his business, but I will not stand idly by while my brothers blood is shed. Nor will I send Americans by force (the draft) to go fight a war they might not believe in. Whether Israel needs an IDF is worthy of debate if the alternative is militias. If Israel only consisted of the coastal plain, then yes, a highly advanced army is absolutely necessary and may not even be enough. In that area, you NEED the mountains. If the land to the Jordan was controlled fully by Jews and loyal Arab gerim, it would be fairly easy to build sufficient defense emplacements.that makes the land unconquerable. A long fought war by a top class army like the US Army, would result in probable Jewish defeat after a long Masada-like siege. But the Arabs, even unified, would not be capable of any sustained siege. Their economies would be obliterated as all resources are devoted to mass armies. If Israel could keep supply lines open or at least rcycle metals into ammunition, it could pretty much just hold the hills and gun down anyone crossing the Jordan. Fortifications would continue down the Rift Valley to Strait. It would probably be useful to set the southern fortifications at the Wadi Arish, and have the south designed as a series of strategic outposts to harass and slow any invading force while a main army was mobilized. The coastal plain is a weak point that could smother supply lines and should be heavily fortified with emplacements that would slow any mobile army. Urban guerrillas would be able to harass invaders here. It would serve to try to funnel the invaders into the mountains, which are easy to maintain the defense of. For a northern border, the Jews would want to set it at the Litani River in Lebanon. And then the mountains just need to be fortified and there is a small coastal choke point that could become a valley of death (Charge of the Light Brigade) for any invaders. Finally, the Golan is already obvious. With strategic land holdership, Israel could be defensible without a large, modern army against local threats. But for now Im American, not Israeli, so unless Jews are being slaughtered there, they can do what they want with their money: army vs militia.